Dance is the ultimate performing art, and dancing onstage at the recital serves as a powerful tool for building a child’s confidence in themselves—a confidence that easily carries over into a dancer’s home life, schoolwork, and friendships. So how can one special event create such a big difference? Well, it’s not just about that day. It’s also about the process leading up to it, followed by the culmination of all that hard work. In our experience at SDC, a rise in confidence begins with effort in the classroom. Our students begin learning new steps and choreography, and as they make the effort to execute those skills, their confidence builds. With compliments and corrections from the teacher, each dancer becomes more determined to improve. In some dancers this confidence boost comes easily over time, but in others it can be more daunting. For example, sometimes there’s a student who feels down on themselves when they aren’t learning a step or concept fast enough. We teach them that everyone learns at their own pace, and with their continued practice and perseverance, they’ll make progress. And when that student begins to see their effort paying off, their confidence soars! Overcoming that temporary “slump” actually helped them see that they can rely on themselves and be stronger for it. As we get closer and closer to the Spring Concert and the choreography for each recital routine is complete, we’ll usually see a spike in confidence along with their excitement for the big day. The more these kids practice, the more assured they become. They can also begin to picture themselves performing, and that visualization inspires them from the inside out. Of course when recital day is finally here, sometimes shyness, nerves, or anxiety can make a dancer’s confidence waver. But if they’ve already built up their “confidence muscles” in class, they can quickly conquer those fears and dance onstage with no worries at all. We’ve seen many students over the years who’ve overcome their stage fright—and then never want to leave the stage! One of the most magical confidence-boosting moments for a performer is hearing the audience applaud, knowing that family and friends are there! It tells the dancers hey are appreciated for dancing their hearts out. It is such a rewarding feeling to realize that your hard work has paid off, and that the audience loved your performance. The pride our students feel in themselves at that moment is well-earned. The sense of accomplishment after getting out there and performing is a triumphant feeling like no other, and it’s not an exaggeration to say we’ve seen it transform lives. 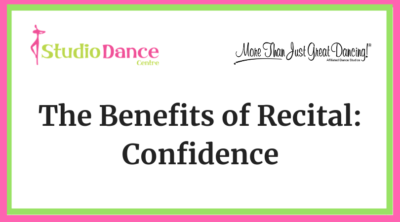 The confidence our students develop is truly one of the most valuable benefits there is when it comes to the recital!